This is a continuation of the work I first reported on last December. 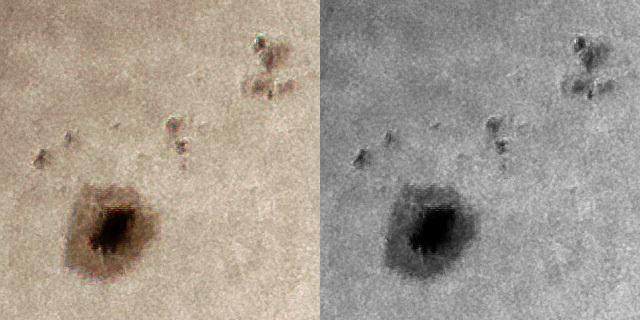 It took almost 3 months for a photogenic sun spot, clear weather, and the loan of a Questar full aperture filter to converge. The result is my attempt at an apples-to-apples real world photographic comparison of five different white light solar filters for the Questar. The results should be helpful to those considering similar white light filters for any telescope. These filters safely reject solar energy at the front end of the telescope. I did not include any eyepiece filters or the Herschel Wedge which allow full intensity sunlight inside the telescope. In brief, there is a picture of each filter, an unprocessed 640 pixel image of the full solar disk, a 2x stacked monochrome closeup of active region 2638 with only image normalization and finally color and monochrome 2x stacked and process images. I always like to know the details first, before seeing results. However, I realize that is a mental aberration of mine. A full description of my testing procedure is at the end. OD 5.0 corresponds to 0.001% or 1/100,000. You may see other measures of optical density including: the reciprocal of the transmission reduction ND100000 or the number of stops of reduction ND116 (for 16 stops of reduction). 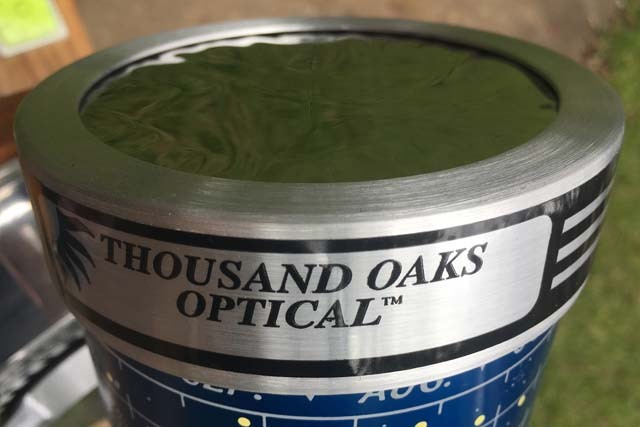 Baader and Thousand Oaks supply filters for visual observing with an OD of 5.0. Questar uses and OD of 4.5. Baader also sells a film intended for imaging with digital cameras with an OD of 3.8. OD 3.8 is about the minimum reduction that you want to avoid possible damage to your image sensor. The Questar filter will be about 3 times brighter than the Baader or Thousand Oaks filters. Questar may have made filters with more than one optical density, I've used one and heard reports of others that are too bright for comfortable visual viewing. The Baader digital camera film will be nearly 16x brighter than their visual grade film and not safe for direct viewing by eye. Neutral density filter rating can be confusing because multiple systems are used. The ND and OD prefixes are both used. A filter transmitting 1/100,000 of the energy may be referred to as ND5.0 or ND100000. The presence of a decimal point can make a big difference - ND4 transmits 1/4 of the energy received and ND 5.0 transmits 1/100,000! The brightness of the image also depends on the focal ration of the telescope that it is used with. Filters designed designed for solar viewing must also filter IR and UV light outside the visual range. You may want to use additional filters at the eyepiece for the most comfortable viewing especially with a fast focal ratio scope. It is always good to have a friend with a bigger telescope as a reference for what you are seeing. 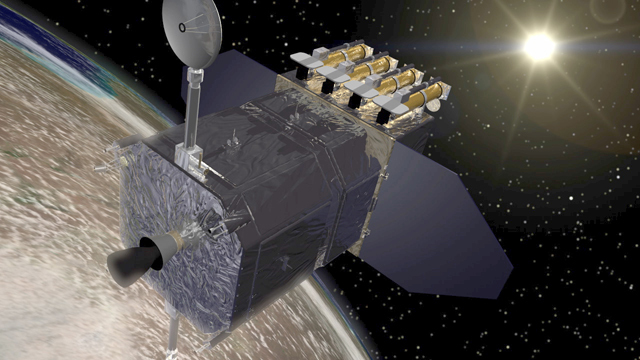 It is even better when it is in space, like the NASA Solar Dynamics Observatory! Images taken from the Solar Dynamics Observatory HMI from the Space Weather site and the SDO archive site. 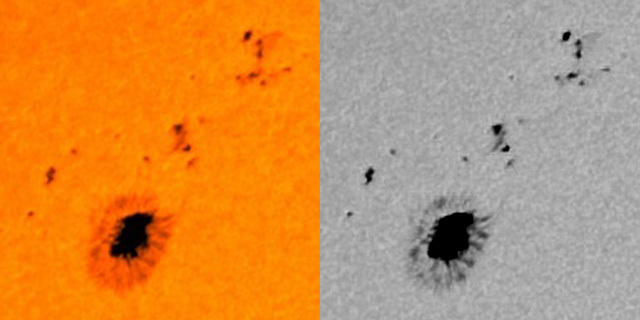 The detailed image crops were up-scaled by 66% to match the scale of the Questar images below. Questar's full aperture white light solar filter uses a triple Chromium plating on a parallel flat of optical grade glass. The one I borrowed for this test was well used and several decades old, yet still gives a fine image of the sun. The filter rejects IR and UV light. The Questar full aperture filter has an OD of 4.5, about three times brighter than the other filters I tested with the typical OD 5.0. As a result it is quite bright and may require an additional ND filter for comfortable viewing by eye. Questars are relatively slow telescopes so the (f14) which probably accounts for the choice. I've looked through another Questar full aperture filter that was darker and more comfortable for visual use; I am not sure if this was produced as a ~ND 5 variant or a replacement filter glass in the Questar filter cell. This less light reduction is better for photographic use. This allows faster camera shutter speeds than filters optimized for visual comfort, minimizing distortion caused by air turbulence due to daytime heating. 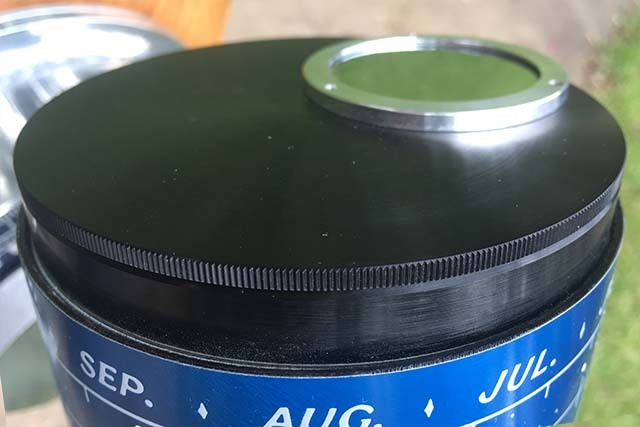 The threaded filter cell shown above has vents to keep the filter and corrector of the telescope cool. This may be important with a bright filter like this. Stacked 6 images exposed at f14 for 1/800 sec at ISO 100. The Baader Planetarium ASTF 80 filter for the Questar provides 80 mm of clear aperture. Baader AstroSolar film is available with many different mountings. The Baader ASTF mounting is designed to avoid stress caused image distorting by avoiding stretching film as the mounting heats up and is faster to install and remove than tight fitting caps or screw on filters. The ASTF mounting does obscure the view from the built in Questar finder. In this test the Baader filter lives up to its top of the line reputation and does it at a cost 1/10 of a high quality optical glass filter like the Questar. Baader also makes an optical density 3.8 AstroSolar film for photographic use only. These images are made with the optical density 5 film intended for visual and photographic use. Stacked 7 images exposed at f14 for 1/80 sec at ISO 100. I used the 95mm threaded camera mount version of this filter which gives a full 89 mm of clear aperture on the Questar. The Thousand Oaks filters are available in both cap style slip fit cells and threaded cells. The threaded mounting shown below makes a very secure attachment to the telescope. The yellow Glass 2+ Thousand Oaks filter has a deep yellow-orange color similar to the Questar filters. They are made from vacuum-deposited layers of nickle, chromium, and stainless steel on the inside surface of the glass. Stacked 7 images exposed at f14 for 1/125 sec at ISO 200. This filter was made with the RG-Film formerly sold by Thousand Oaks and not the SolarLite film that they currently sell. The clear aperture of this filter is 86 mm in a slip fit mount that slides onto the Questar dew shield. Thousand Oaks now distributes a new film they call SolarLite. I've seen different reports claiming both that the RG and SolarLite film are superior to the other. I suspect that the conflicting impressions are due to sample to sample variation. Stacked 8 images exposed at f14 for 1/200 sec at ISO 100. 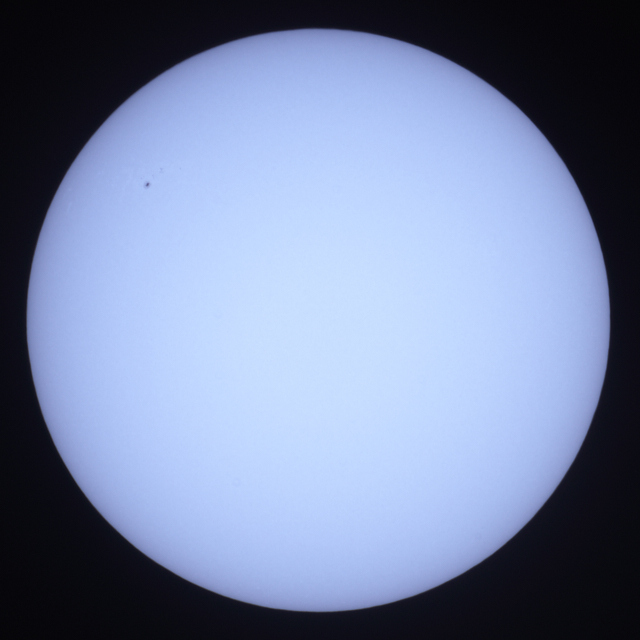 This is the standard 40 mm sub-aperture off axis solar filter included with Questar 3.5" telescopes. The 95 mm threaded mounting makes a very secure attachment to the telescope. Adequate for casual observing, resolution is substantially lower than the full aperture filters above. Stacked 6 images exposed at f14 for 1/200 sec at ISO 100. Good images can be produced with any of the full aperture filters tested. The differences between them are far less than the moment to moment seeing variations due to daytime heating. None of the filters show the sun in its true white color. The filters tested included blue-violet, yellow-brown, and yellow-orange tints. 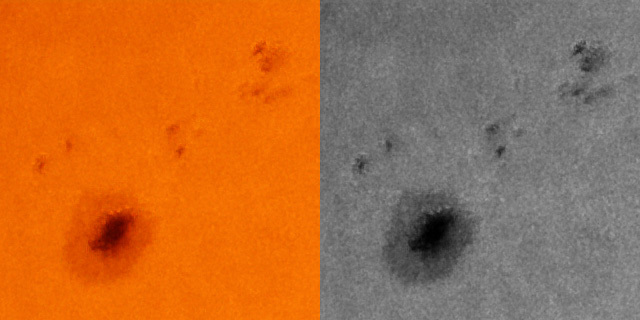 The lack of color detail in a white light solar image, makes color preference an individual choice. A monochromatic solar image can also be rendered in your favorite color in post processing. The Questar full aperture glass and the Baader AstroSolar film filters consistently gave good results. 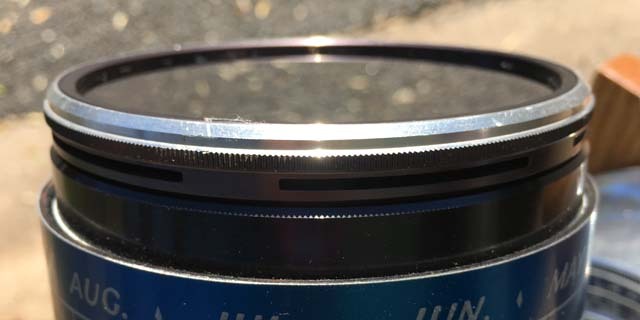 The filter cell that Baader makes for the Questar gives only 80mm of aperture, but that didn't make a significant difference. Other mountings of the Baader film can give the full 89mm aperture. Given that the Questar filter costs and order of magnitude more than the Baader filter, Baader is my go-to filter for photographic use. 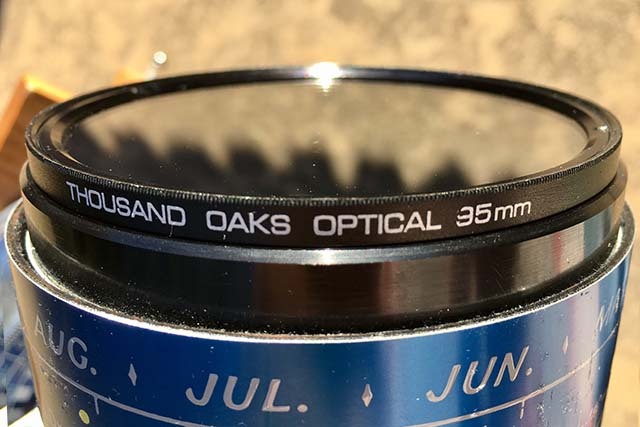 The Thousand Oaks glass and film filters follow close behind the first group but give, in the testing of my samples, slightly inferior images. Personally, I prefer the yellow-orange color of the glass filters. The color contrast enhances the intensity contrast of the image to my eye. The Thousand Oaks glass filter is my favorite for visual use because of this. 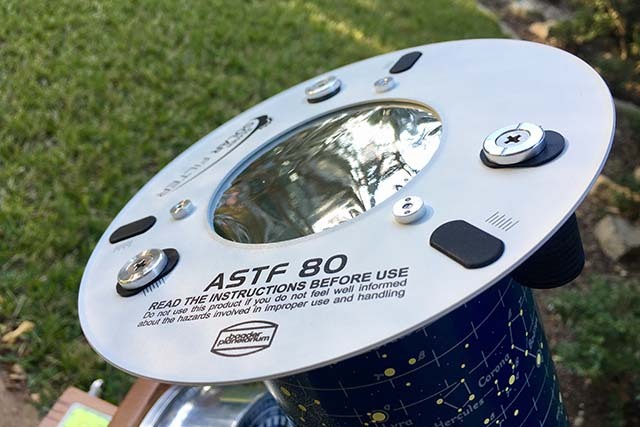 its more secure threaded on mounting is an added safety bonus at star parties. 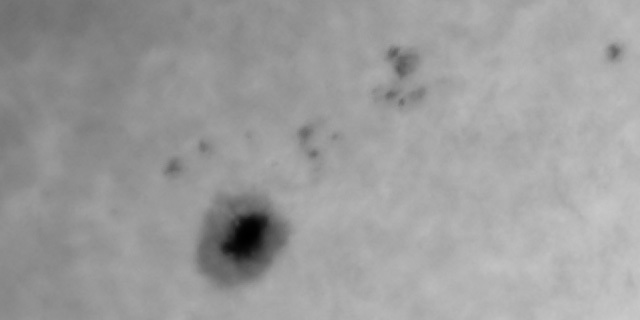 The Thousand Oaks RG filter had better detail in the sun surface and faculae but poorer sunspot detail. This may be due to exposure differences because of the slightly brighter exposure. The 40mm Questar sub-aperture filter is fine for casual visual observing, but gives away too much resolution for satisfactory imaging. 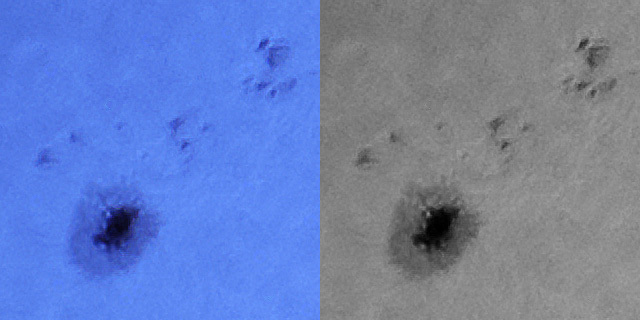 I dropped the comparison images, that I used in earlier tests, with the green #58A filter and used only a UR/IR cut filter in addition to the white light energy reduction filters. A narrower pass band can improve results with any of these filters. The additional filtering does increase exposure times and sensitivity to seeing turbulence. Simplifying the number of setups allowed me to cut the number of still images used in half. Completing the time more quickly kept seeing conditions more uniform. I repeated the tests for the first 3 filters, at the end of the session, to make sure that seeing had not changed noticeably during the course of the test. Over 1100 images were taken for this comparison. All images were taken on 2017-02-22 from 16:53 to 17:42 UT from Austin, Texas. Approximately 140 still images were taken with each filter using a Sony Alpha 6300, 24 MP, mirrorless APS-C sensor camera at prime focus. Exposure time was set to 1 stop slower than the fastest exposure where zebra 90% over exposure warnings were visible. This keeps the histogram away from near saturation and the loss of reciprocity (and contrast) that can occur there. If the resulting exposure time was less than 1/80 of a sec the ISO was increased by full stops until the exposure time was less than 1/80 sec. The crops of the resulting images near the sunspot group were all automatically graded for quality in Lynkeos. The top scoring images were examined by eye with the best images, 6-8, selected for stacking. Stacking was on a 2x grid with 1.5 sigma filtering of the data. The cropped and stacked images were deconvolved in Lynkeos to increase resolution. The histogram was stretched to full scale in Photoshop and the midpoint adjusted to the peak of the monochrome histogram, and a mild linear contrast boost applied. Each filter includes an image of the filter mounted on the Questar. Next is a full disk image of the sun taken with the filter. Other than scaling from 3600 pixels to a 640 pixel wide image no other processing was done on the full solar disk image. This image gives a good representation of the size and color of the sun in a 24mm eyepiece. The processed 2x close up images of the sunspot group are last. One in color and one in monochrome to facilitate comparisons between different color filters. Thanks to Ralph Encarnacion for his very timely loan of the Questar full aperture filter. I agree with the results that you found for the solar filters. I actually removed the glass from my Questar full aperature filter and made a "cell" to hold the Baader material in its place, hence I get the full 89mm and a screw on filter. It works as you found. Great study/analysis you have done.